Access to high-quality textbook: when will it happen? In recent years, most people, especially parents argue that there are a lot of textbook errors in schools. It is worth to mention here that school textbooks such as history of Kazakhstan, English, Kazakh and Russian languages, science subject textbooks have grammatical, spelling, punctuation mistakes as well as “absurd” errors. We can easily find a number of examples on the Internet. 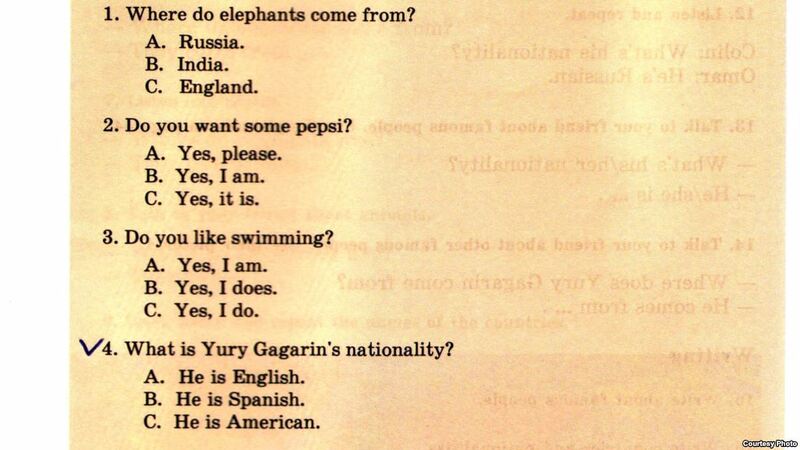 For instance, this example shows that some test questions don’t have correct answer in one English textbook, whereas litle children know that Yury Gagarin was a Russian. Many textbooks don’t take into account the age of children at all, because there are a lot of complicated tasks for primary school children which are difficult even for adults to find an answer. Likewise, most of you might be familiar with mistaken questions in UNT like chronological dates of history. One common factor is that many arguments and complaints are about textbooks in Kazakh language because of direct translation. Sometimes it seems that these textbooks are translated by “uneducated experts” who definitely have no proficiency in Kazakh language. You will lose yourself reading these illiterate pieces of work in terms of meaning of complex sentences, terms and inequivalent translations of phraseological units and etc. It is evident for everyone that we are elaborating a trilingual education policy which also draws attention on expansion of Kazakh language. So, if mistakes in Kazakh textbooks will continue on, not mentioning about Kazakh education quality, how will we preserve our mother tongue?! Overall, I have no idea who is in charge for high-quality school textbooks (publishers? or authors?) and why experts allow publishing textbooks turning a blind eye. So many school textbooks are being printed last time and can not get rid of errors though it costs a lot of money. Despite the fact that journalists and teachers are debating many times about textbook content and structure, no serious steps are still undertaken.